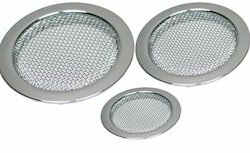 Manufacturer of a wide range of products which include pharmaceuticals sieve and vibro sieves. Extensively used in drug making industry for filtration procedures. The product is exceptional in retaining particles, owing to its fine mesh size. It is resistant towards corrosion and rusting, owing to the use of high quality stainless steel for making it in modernized manufacturing unit. They are widely used in cosmetic, paint and powder industry and are easy to clean with low maintenance. The products can be supplied in bulk within the stipulated time period.